Twelve-year-old Nella Sabatini’s life is changing too soon, too fast. Her best friend, Clem, doesn’t seem concerned; she’s busy figuring out the best way to spend the “leap second”—an extra second about to be added to the world’s official clock. The only person who might understand how Nella feels is Angela, but the two of them have gone from being “secret sisters” to not talking at all. Then Angela’s idolized big brother makes a terrible, fatal mistake, one that tears apart their tight-knit community and plunges his family into a whirlwind of harsh publicity and judgment. In the midst of this controversy, Nella is faced with a series of startling revelations about her parents, friends, and neighborhood. As Angela’s situation becomes dangerous, Nella must choose whether to stand by or stand up. Her heart tries to tell her what to do, but can you always trust your heart? The clock ticks down, and in that extra second, past and present merge—the future will be up to her. You know when a book hits you so hard that you don't even know where to start when you try to recommend it to someone? Yeah, that's this book. The main character, Nella, is so achingly real -- in her thoughts, her relationships with her friends and family, her actions. Nella lives in a neighborhood called Little Italy in an unnamed city. I adore the cover of this book, because the setting is so vividly described that it's almost a character in and of itself. Little Italy holds tightly to its traditions, even as it's squeezed on either side by an upscale neighborhood at the top of the hill and "that other neighborhood" down the hill. Nella's father tends the neighborhood cemetery, where the ponderous (yet humorous) statue of Jeptha A. Stone resides. (Jeptha gets his own, short chapters in the book.) The book alternates between the present day and Nella's past. There is a lot packed into this book -- themes of family, forgiveness, friendship, and acceptance. Not only must Nella come to terms with her friend's brother's actions, she also deals with the closing of her beloved school (and as Catholic school girl who went to a tiny parish school that closed a few years after I graduated, this storyline really hit home for me), the realization of her father's life-changing mistake, where she fits into her big family, and how to be a good friend. Yet the book never feels overwhelming or stuffed. In fact, it's compulsively readable. 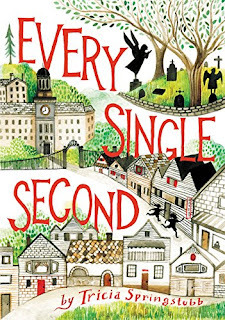 Nella's voice shines through each page, and it does what some of the best middle grade books out there do -- deals with big issues in a way that allows kids to either see themselves and the world around them, and shows them the importance of empathy. ". . . the true test is not what we choose for ourselves. It is how we deal with what life chooses for us." EVERY SINGLE SECOND will be available to purchase on June 7th.